The sleeve gastrectomy is classified as a restrictive surgery. 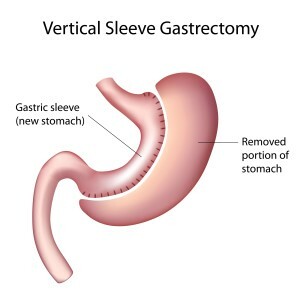 The surgery is performed laparoscopically wherein about 80% of the stomach is removed and the shape of the stomach is changed from a sac to a long, narrow tube (sleeve). The main effect is from the reduced volume of the stomach, so eating only a small amount of food results in a feeling of fullness and early satiety. Weight loss is not the only effect of the operation, but metabolic also. It has been documented that after the operation, improvement in the control of Type 2 Diabetes is achieved even before weight reduction. Studies have shown that the top fundus part of the stomach produces the hunger hormone, Ghrelin. The fundus of the stomach is removed in this operation. Metabolic changes or improvement in Type 2 Diabetes may be due to decreased gastric volume, pylorus restriction, decreased Ghrelin, fast gastric emptying, increased peptides, and a fast small bowel transit time with malabsorption. Rapid improvement in Type 2 Diabetes. Usual weight loss- 50-60% of excess weight in 1-2 years.